Recently, Palm Oil has become as important to consumers, as Parabens and SLS! Using Palm Oil in Soaps and Cosmetics has become popular, as the cost factor is low. However environmentally the cost is extremely high. What about RSPO, Well even though the organisation has strict guidelines that producers and growers have to abide by, We as a company didnt feel comfortable that even with traceability, that any palm oil cultivation, was going to affect the forests and wildlife. What about the companies involved and the growers businesses and their livelihoods? That is a question that we have been asked on numerous occassions, and we agree that the rspo approved suppliers do support many people and businesses, But our decision was made on environmental and ethical grounds. There are still plenty of business using Palm Oil, including big businesses. Some not RSPO approved, but many moving to it! However, we Do Not Use Palm Oil in any of our products. What is Palm Oil? Palm oil is a form of vegetable oil obtained from the fruit of the oil palm tree (Elaeis Guineensis). It has recently become one of the world’s most widely-produced oils and is a key ingredient in many cosmetic products and Food Products. Why dont we use it? It is our opinion that the wide use of palm oil has severe consequences. To make room for palm tree plantations, tropical rainforests have been cleared on a massive scale. Some sources quote that areas of rainforest the size of 5 football pitches disappear every minute due to palm oil cultivation. Deforestation of course has horrific consequences including, but not exclusive to increases in greenhouse gas production and habitat destruction. 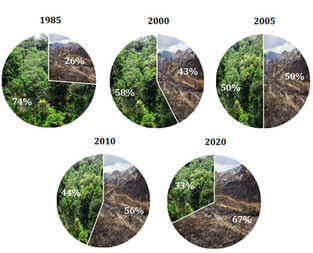 The situation is worst in Indonesia and Malaysia, who between them produce 83% of the world’s palm oil, It is estimated that in 15 years, 98% of Indonesia and Malaysia’s rainforests will disappear because of deforestation. Inevitably along with the destruction of expansive rainforests comes the destruction of natural habitats. 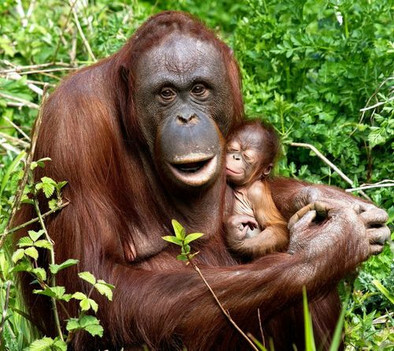 Orang-utans have suffered the most, with their population in the wild declining hugely in recent years. There are numerous campaigns that have been launched in order to combat deforestation and the devastating effects of palm oil production, from Rainforest Action Network to Greenpeace. In skincare, even if palm oil doesn’t appear on the label’s INCI list - as “Elaeis Guineensis Oil” or “sodium palmate” – the form used in soap bars – it might still be hidden in the product. Palm oil is commonly used to make emulsifiers and detergents. We make sure that none of the ingredients that we use contain any derivative of palm oil. Although RSPO, which is responsibley sourced palm oil is available, and it claims to come from areas that are not encroaching on habitat or deforestation. We believe that it must make more sense to re-plant the rainforest species which provided more benefit for the local economy, even if the short-term economic losses are hard. And in cosmetics, there is no real excuse for using palm oil. Better alternatives are numerous and include olive oil and coconut oil which produce fantastic, high-quality soaps and cosmetic products. That is why The Bathhouse and Soapery is proud that it does not use any palm oil at all in ANY of its products!